Warburton will miss the first half of the season. 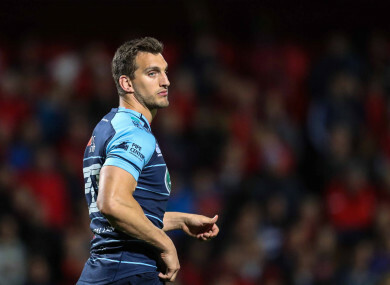 CARDIFF BLUES AND Wales captain Sam Warburton faces another lengthy period on the sidelines after he aggravated a long-standing neck injury in training last week. The 28-year-old, who led the Lions to a series draw with New Zealand this summer, will now undergo surgery and Cardiff say he will be out for a period of four months. It means Warburton willmiss the first half of the Guinness Pro14 campaign, the Challenge Cup pool stages and Wales’ November international fixtures against Australia, Georgia, New Zealand and South Africa. Warburton had yet to make an appearance for the Blues this season having only just returned to pre-season training, and this latest injury setback comes after he missed six weeks at the end of last season with a knee injury. “Sam Warburton will undergo surgery following a recurrence of a long-standing neck injury,” Cardiff said in a statement released this afternoon. Warburton’s absence is a huge blow for Cardiff, who have already lost the services of Ellis Jenkins for 12 weeks and James Botham for four months. Josh Navidi is now their only specialist open-side flanker. His absence paves the way for Ospreys and Lions back-row Justin Tipuric to take over the captaincy reins. Wales face Australia in Cardiff on 11 November, before home internationals Georgia and New Zealand precede their final Test of 2017, against South Africa on 2 December. One encouraging piece of news is that, if the current prognosis holds, Warburton should be fit for Wales’s Six Nations opener against Scotland on 3 February. Email “Big blow for Wales and Cardiff as neck surgery to sideline Warburton until 2018”. Feedback on “Big blow for Wales and Cardiff as neck surgery to sideline Warburton until 2018”.